Description: A couple of Dash 9s awaiting assignment at Calwa. Description: One of several strings of locomotives without assignments at Calwa Yard. Notice the UP unit near the middle. Description: C44-9W 5359 roars through West Naperville (IL) plant with pigs in tow on a drizzly Spring day. Description: CN 250 or 280 not sure is seen just west of Bancroft. Description: EB stacker rolls past De Soto under a whispy cloud cover! Description: Yes, it was snowing on April 26th 2008 in St. Paul. Description: BNSF 5359 West rolls into Ashland for a crew change before heading to Sioux City. Description: About to roll under the bridge. Description: Bending into the curve. Description: The H-NTWTUL (Northtown Tulsa) departs with quite the interesting consist off the 603. Description: The Z-PTLCHC is in the company notch as it passes by Genoa WI Saturday morning. Title: BNSF 5359 BNSF Aurora Sub. Description: A BNSF manifest heads through Metairie. Description: CSX Q380 crossing Bennetts Conrers Road at 49 mph. 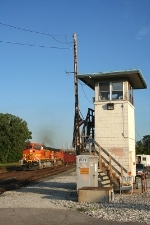 This location is at QC 302.55 of the CSX Rochester Subdivision. Matt Jacobus also caught this train!